This Jizo is believed to keep babies from crying at night. 'god of children who weep nightly' . 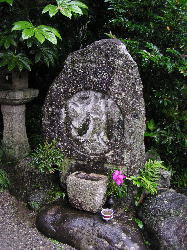 At the temple Okamoto-Ji in Asuka there is a stone dedicated to Bonten (A-Ten 阿（梵）天). In former times, there was a small hall for the meditation of the sanskrit letter A (ajikan meditation). Monks would sit in front of the stone and meditate about the beginning and end of things. The Japanese letter for "breath" iki　息, means "jibun no kokoro 自分の心, your own self, your own heart, your origin". That is what you strife for in your meditation about the letters A and Un. A means the breathing in, UN means the breating out of one cycle of breathing. This stone also was the subject of prayer for mothers with a baby that would cry at night (yonaki). If their prayer was sincere enough, the baby would stop crying. This belief is maybe linked to the sound of "aaa, aaa" when a baby cries. People come from the souce of A, experience a lot of ups and downs in life and finally return to the letter UN in the end. There are other places with a Jizo who helps with crying babies in Japan. The messenger of the Yonaki Jizo at どうめき沢 / 百目木沢 Domekizawa swamp is a weasel. "Shall I eat some soy beans, or shall I eat a crying child?" When the children hear this, they soon stop to cry. Once the voice of a crying child was heard every night from the zushi 厨子 miniature shrine in the main hall of 春日神社 Kasuga Jinja. 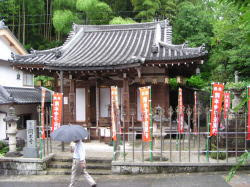 春日大明神 Kasuga Daimyojin was worshipped as Jizo Bosatsu. But it seemed that the Jizo Statue wanted to go to Shin-Yakushi-Ji temple and so it was removed to there.
. Anzan Kosodate 安産子育て - all about Children .